The Dr Shezad Malik Law Firm helps folks get the recovery they need after being involved in an Asbestos exposure cancer and mesothelioma. Asbestos litigation and mesothelioma lawsuits are called toxic tort litigation. This type of lawsuit is typically brought against a manufacturer or supplier of a toxic chemical or dangerous substance that causes personal injury, illness or wrongful death. Asbestos is a group of minerals that occur naturally as bundles of fibers. There are 2 main types of asbestos fibers: The most common asbestos in industrial use, known as chrysotile, or white asbestos, has curly fibers. Amphibole asbestos fibers are straight and needle-like. There are several types of amphibole fibers, including amosite, crocidolite, tremolite, actinolite, and anthophyllite. Who is at Risk for Developing Asbestos Related Disease? People are exposed to asbestos mainly by inhaling fibers in the air they breathe. This may occur during mining and processing asbestos, making asbestos-containing products, or installing asbestos insulation. It may also occur when older buildings are demolished or renovated, or when older asbestos-containing materials begin to break down. People most at risk for developing mesothelioma or other asbestos-related illnesses include workers whose jobs directly expose them to asbestos fibers. The people with the heaviest exposure are those who worked in asbestos industries, such as shipbuilding and insulation. Many of these people recall working in thick clouds of asbestos dust, day after day. Family and friends of these workers are also at risk due to "household exposure." There are cases of spouses and children of workers who develop asbestos-related illnesses like mesothelioma as a result of second-hand exposure to their spouse or parent who was directly or indirectly exposed to asbestos. Asbestos fibers produce dust. When inhaled, asbestos dust forms deposits in the lungs that can cause illnesses include mesothelioma, lung cancer and asbestosis. Workers exposed to asbestos from the 1940s through the 1970s continue to develop mesothelioma, lung cancer and asbestosis after a very long latency period. Several federal and state agencies have the authority to regulate asbestos. These agencies include the U.S. Department of Labor/Occupational Safety and Health Administration (OSHA) and the U.S. Environmental Protection Agency (EPA). Several diseases are common among workers or family members exposed to asbestos. These are malignant mesothelioma, lung cancer and asbestosis. Malignant mesothelioma is an extremely aggressive cancer. Asbestos exposure is the only known cause of this terminal illness. The three types of malignant mesothelioma are: Epithelioid, Sarcomatoid and Mixed type. Asbestos exposure is known to cause lung cancer. The combination of asbestos exposure and cigarette smoking is especially deadly. Scientific studies published by the U.S. Surgeon General indicate that people who smoke and were exposed to asbestos on the job are 90 times as likely to develop lung cancer as people who smoke but were never exposed to asbestos. 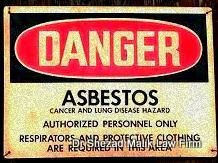 Asbestosis is a lung disease caused by inhaling asbestos dust. The disease produces inflammation and scarring (fibrosis) of the lung. Inhalation of asbestos fibers has been linked to an increased risk of lung cancer in many studies of asbestos-exposed workers. In general, the greater the exposure to asbestos, the higher the risk of lung cancer. Most cases of lung cancer in asbestos workers occur at least 15 years after initial exposure to asbestos. In workers exposed to asbestos who also smoke, the lung cancer risk is much greater than even adding the risks from these exposures separately. Mesothelioma is a rare form of cancer that affects the thin membranes lining organs in the chest (pleura) and abdomen (peritoneum). Mesothelioma is closely linked with asbestos; most cases of mesothelioma result from direct exposure to asbestos at work. Studies have found an increased risk of mesothelioma among workers who are exposed to asbestos, as well as among their family members and people living in the neighborhoods surrounding asbestos factories and mines. Mesotheliomas typically take a long time to develop. The time between first exposure to asbestos and diagnosis of mesothelioma is usually 30 years or more. Unfortunately, the risk of mesothelioma does not drop with time after exposure to asbestos. The risk appears to be lifelong. Unlike lung cancer, mesothelioma risk is not increased among smokers. The major health problem caused by asbestos exposure, is a lung disease called asbestosis. When a person breathes high levels of asbestos over time, some of the fibers lodge deep in the lungs. Irritation caused by the fibers eventually leads to scarring (fibrosis) in the lungs. This can make it hard to breathe. The main symptoms of asbestosis are shortness of breath and a chronic cough. When asbestosis occurs, it is typically 10 to 20 years after the initial exposure to asbestos. The disease can get worse over time. While some people may not have serious symptoms, others may be seriously disabled by breathing problems. Unfortunately there is no effective treatment for this disease. Asbestos can also reach the outer lining of the lungs (pleura), where it can cause pleural plaques (areas of hard, scar-like tissue in the pleura), pleural thickening, and pleural effusions (buildup of fluid between the lungs and the pleura). All of these conditions can make it harder to breathe. Many victims of asbestos disease and their families are entitled to receive asbestos exposure compensation because manufacturers of asbestos-containing products often knew about the dangers of asbestos. In fact, asbestos has been linked to cancer as early as the 1930s. The evidence shows that these companies did not advise workers of the potential hazards of their products, nor did they make any effort to put warning labels on the products to inform workers of the dangers of asbestos. As a result of this failure to warn, hundreds of thousands of workers have developed asbestos-related diseases over the past century. Many have died. Bringing legal action against these companies is one remedy available to you. How can Dr Shezad Malik Law Firm Help My Family? Dr Shezad Malik as a practicing physician and attorney he understands the devastating consequences of mesothelioma, lung cancer and other asbestos-related diseases. We have a special understanding of the liability of asbestos defendants. This includes issues as when the manufacturer, supplier, contractor and/or employer first understood about the dangers of asbestos, and what they failed to do to warn and protect workers and their families. Information and commentary provided by Dallas Fort Worth Personal Injury Attorney Dr Shezad Malik. The Dr Shezad Malik Law Firm can be contacted in Dallas toll free at 888-210-9693. If you or a loved one has been injured from Asbestos Mesothelioma or Asbestosis, please fill out our contact card for a free consultation.